Loved the colors and they went well with the other sets so my daughter could mix and match - the nursery is adorable and all set for our little man on the way! Outfit the nursery with a nine-piece bed set that includes everything required for a night of comfort for new family members. 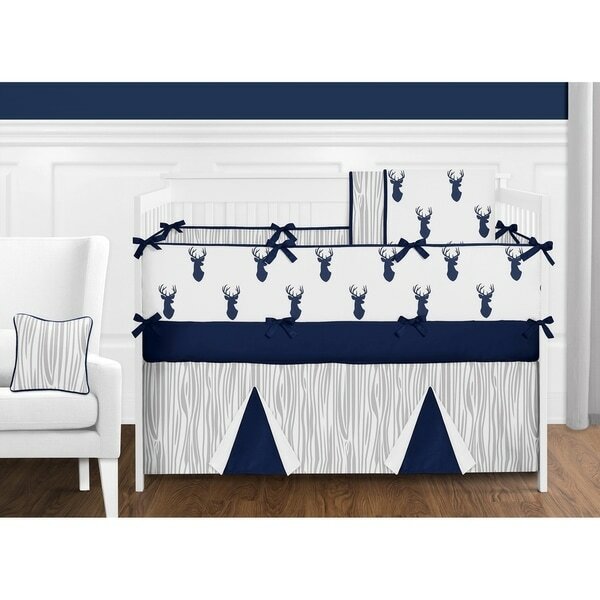 The woodland-themed set is printed with a navy blue stag silhouette and made from washable microfiber for easy care. Warning: Loose bedding can present a Hazard. Please follow safe bedding practices as recommended by the Consumer Product Safety Commission. Due to local crib bumper pad regulations this item cannot ship to certain U.S. cities and states. Dimensions 45.0 In. X 36.0 In. X 0.5 In. So soft and I can't wait for baby to come and try it out! "is the bumper pad and blanket the deer print??? also is the carousel over the bed available???" 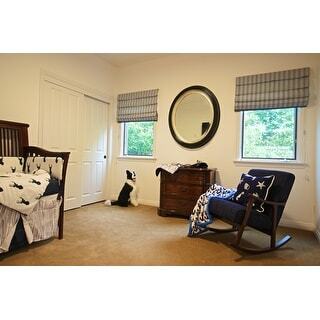 The bumper and comforter both have the deer print on the front and a woodgrain print on the back. "Nothing states what the 9 pieces are... Outfit the nursery with a nine-piece bed set that includes everything required for a night of comfort for new family members. Can you tell us what the exact nine pieces are?" Crib Blanket: 45in. x 36in. 2 Window Valances: 54in. x 15in. ea. Crib Skirt: 52in. x 28in. x 15in. drop Fitted crib sheet: 52in. x 28in. x 8in. pocket 4pc Crib Bumper: (2)Short Sides-27in. x 10in. ea. (2)Long Sides-52in. x 10in. ea. Diaper stacker: 15in. x 6in. x 20in. Toy bag Pillow. Do you have a baby bed for 3 yr old autistic children that you want to keep more snug at night? FAQs about Baby Bed Sheets from Overstock.com. Our guides provide customers with answers to frequently asked questions about baby bed sheets. Whether you're welcoming your first, second, or last infant, decorating the nursery is a fun and exciting way to prepare for your child's arrival. Use these nursery ideas as an inspiration to create an adorable and comfortable space for your little one. Learn everything you need to know before bringing baby home. Shop our huge selection of newborn baby essentials at Overstock.com.